A chance find in a site known as the Cave of Swimmers adds a colourful twist to an exhibition in Paris celebrating the work of ethnographer Leo Frobenius in raising awareness of the rock art of Africa. The discovery by Italian archaeologist Dr Giulio Lucarini, currently at Cambridge University, underlines the vital importance of safeguarding the heritage of the Gilf Kebir. Captured by the camera, she looks enviably elegant with her sketching paper and paint brush. Working in the baking heat of North Africa in 1933 a young German artist called Elisabeth Pauli created meticulous records of the vivid paintings made at least 6,000 years ago in a site known as the Cave of Swimmers in Gilf Kebir, an area on the border of Egypt and Libya famed for its rock art. On the same expedition out in the Eastern Sahara were the Hungarian aviator and desert explorer László Almásy, the renowned German ethnographer Leo Frobenius, and his colleague Hans Rhotert, who published the results of the expedition in 1952 in the volume Libysche Felsbilder. It was Almásy whose rip-roaring adventures across North Africa and beyond provided the inspiration for the main character in Michael Ondaatje’s prize-winning novel The English Patient, made into a film by Anthony Minghella. The watercolour sketches that Elisabeth Pauli made, and the striking photographs that show her at work in the Gilf Kebir, belong to the Leo Frobenius Institute in Frankfurt am Mein. Copies of both sets of images feature in an exhibition, Leo Frobenius et L’Art Rupestre Africain, opening today (17 June 2014) at the Goethe Institute in Paris. The remarkable discovery of some of Pauli’s original materials in the Cave of Swimmers by a team of Egyptian and Italian archaeologists – among them Dr Giulio Lucarini, currently a researcher at Cambridge University – adds an extra dimension to the story of human encounters told by these images. Shown for the first time at the Goethe Institute are Lucarini’s photographs of the tubes of watercolours Pauli used, and the drawing pins (or thumb tacks) that held the paper on which she skilfully recorded what she saw, in the newly-discovered site which takes its name from the swimmer-like forms of the humans depicted. 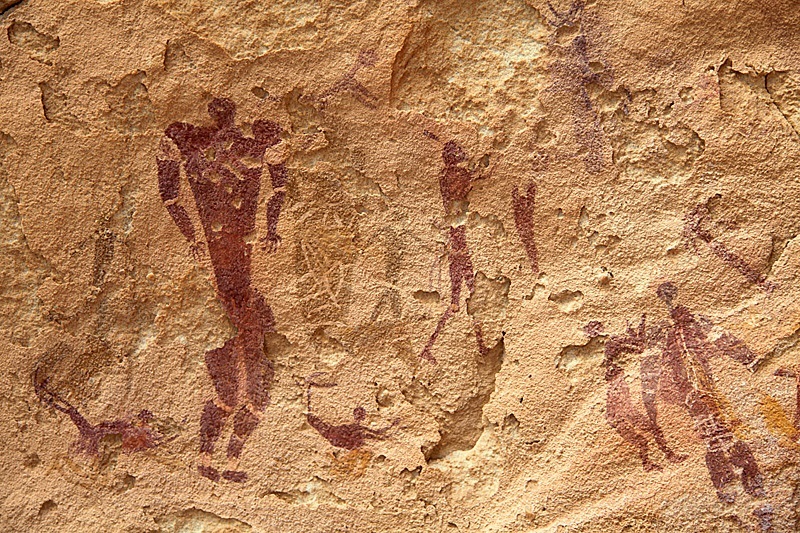 In 2010 Lucarini was the Field Director of the Italian Conservation Project in the Gilf Kebir, run by the Italian-Egyptian Cooperation Programme, working on the conservation of the art in the Cave of Swimmers in the first phase of pioneering efforts to preserve a remote rock art site. The intervention in the Gilf Kebir was supported and promoted by the Italian Ministry for Foreign Affairs in the framework of a long-lasting activity that the Italian Development Cooperation leads in Egypt for the protection of threatened areas. Overseen by Professor Barbara Barich of the Sapienza University of Rome and ISMEO, the archaeologists and restorers were undertaking the delicate task of stabilising an area of cave art that was becoming increasingly eroded. As a preliminary to starting the work, the team cleared the floor of the cave beneath the drawings. Rock art sites have proved a magnet for tourism with its attendant litter and, with no control on access, many have also been extensively vandalised. Within minutes, Lucarini was almost certain that he was holding in his hands the watercolour tubes and drawing pins that Elisabeth Pauli had used and discarded in 1933. What could have been swept into a black bin bag, along with the detritus of visiting tourists, for disposal back at Dakhla Oasis, were items that told a poignant story about the history of the exploration of the site. 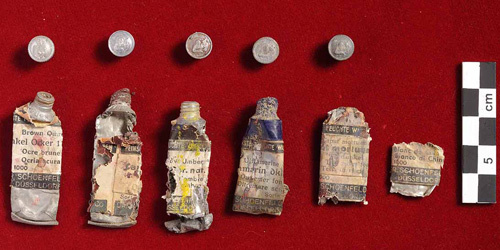 “The labels on the six watercolour tubes we found have survived and are marked with the name of Dr F Schoenfeld, the founder of a company called LUKAS, which still manufactures artists’ supplies in Düsseldorf. The tubes also carry the names of the colours: caput mortuum, ultramarine, Chinese white, brown ochre and raw umber. These shades tally closely with Pauli’s paintings and the predominant colours of the rock and the figures which were made using mainly red and yellow ochre and white kaolin,” said Lucarini. The heads of the dozens of artist’s drawing pins that Lucarini picked up in the cave bear the name Günther Wagner with an eye-catching logo of a pelican feeding four chicks. Once he had access to the internet back in Dakhla Oasis, he was able to trace them to the Pelikan company, a firm which still makes writing and craft materials. Also found on the cave floor were two fountain pen nibs, a Haus Neuerburg aluminium cigarette box of the type used by German troops, and a spent soda capsule. The eight decades that have elapsed since the inter-war years in which Almásy, Frobenius and Rhotert publicised their finds have seen the unfolding of a bitter-sweet story for the priceless artworks of the Eastern Sahara. Gilf Kebir has attracted increasing numbers of tourists whose incursions into archaeological sites are largely unregulated and all too often damaging. Vandalism by a small number of people determined to destroy and disfigure works of art has become a growing problem with caves and shelters defaced by graffiti. Among the sites affected is the Wadi el Obeiyid Cave, in the Farafra Oasis, which was first investigated by Barich in 1995. Archaeological projects working in the Sahara must make safeguarding these sites an absolute priority. Professor Rudolph Kuper and colleagues from the University of Cologne, have been working in the Gilf Kebir for many years and have been pioneers in desert protection programmes,” said Lucarini.